More people voted “yes” than “no,” but the Hawaii Supreme Court ruled that ballots left blank on the question were additional “no” votes. Hawaii’s Constitution mandates that once a decade, next on Nov. 6, the people of Hawaii be granted the right to call a state constitutional convention to propose democratic reforms for popular ratification. 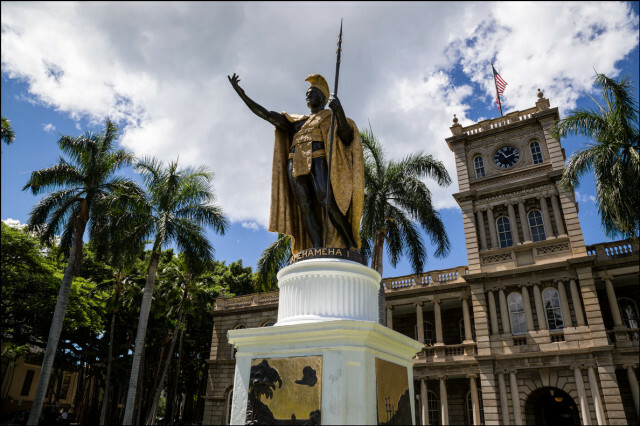 Hawaii’s framers included this decennial mandate to secure the people’s most fundamental political right: to reform their government — even in the face of the Legislature’s opposition. But what type of majority should be used to determine whether the people have called a convention? In 1996, a majority of those voting on the referendum, an “ordinary” majority, approved calling a convention. Hawaii’s Office of Elections affirmed that the referendum was approved based on an opinion issued by Hawaii’s attorney general, Hawaii statute, past practice, and the Office of Elections’ own ballot guidance prior to the 1996 election. A statue of Kamehameha the Great rises in front of Aliiolani Hale, the home of the Hawaii Supreme Court. But state legislative leaders and unions, which had opposed calling a convention, disagreed. The AFL-CIO sued, arguing that non-votes on the question among those who cast ballots should be counted as “no” votes — an “extraordinary” majority. The case went to Hawaii’s Supreme Court, which ruled in favor of the AFL-CIO. A federal court subsequently overturned part of the Hawaii court’s opinion, ruling that the election should be redone. But a federal appeals court overruled the lower federal court’s ruling. Hawaii’s Legislature then passed a bill to redo the election, thus eliminating the risk that the U.S. Supreme Court would rule on appeal that the convention referendum had passed. At the subsequent election, with the opposition vastly outspending supporters, the referendum was unambiguously defeated. What is the law? Both the plaintiffs and defendants argued that the text of Hawaii’s Constitution unambiguously favored their own interpretation. But the defendants sought to prove too much: they only needed to prove the language’s ambiguity. As it turns out, ambiguously phrased majority denominator referendum requirements, like Hawaii’s, have been common in American constitutional, statutory and regulatory legal history. Indeed, prior to the Civil War, they were the norm. Even today, they are widespread in state constitutions and ubiquitous in popular and political speech. Fueling this propensity for ambiguity is not only garden-variety intellectual sloppiness, but political self-interest. Politicians seek to portray themselves publicly as representing a majority of the people and thus above politics, but winning requires focusing on a small majority denominator (a “majority of the people voting”). Vague majority statements finesse this PR dilemma. Barring compelling evidence to the contrary, legislatures and courts have traditionally interpreted such ambiguity as unambiguously referring to an ordinary majority. Bolstering this interpretative tendency has been the Legislature’s self-interest: Legislators want their own proposals to pass. Even in the relatively rare cases when majority language opposing a legislature’s self-interest has been unambiguous, courts have generally acceded to the legislature’s gimmicks to make an extraordinary majority function as an ordinary one. These gimmicks include making a referendum a special election, placing it on a separate ballot, and making the default ballot choice for a non-vote be a “yes” vote. This type of relationship between an agenda-setting and lawmaking majority was in keeping with traditional American democratic norms. For example, authoritative manuals of democratic procedure, such as Robert’s Rules of Order, never endorse the type of inverse relationship endorsed by Hawaii’s Supreme Court. None of America’s 236 state constitutional conventions since 1776 explicitly endorsed such a relationship. America’s federal Constitution amendment process lacks such a relationship. And in the 19 U.S. states with the popular constitutional initiative — the primary alternative legislative bypass mechanism in America — none require more than a 15 percent majority to place a constitutional amendment on the ballot. Given the Hawaii Supreme Court’s conflict of interest, a legal remedy will most likely have to come from a federal court. I suggest focusing on the First Amendment abomination of making the majority required to call a convention larger than the original majority required to ratify its proposals. Legal scholars and political scientists have often observed that constitutions are mere parchment barriers unless the people are able and willing to fight for their rights. These rights include the people’s right to reform their government in the face of a legislature’s opposition. Hawaiians were unjustly deprived of a constitutional convention they fairly voted for in 1996. We must never allow this gross injustice to happen again.